In 1902, Britain formed an alliance with Japan to help combat Russian expansionism in the Far East: Britain wanted to protect its interests in China, and Japan its interests in Korea. The friendship between the great British Empire and the rising imperial power of Japan was a factor in the Russo-Japanese War, discouraging Russia's ally France from entering the war against Japan. It also had a role in the status of Japanese immigrants and their families in Canada: anti-Asian sentiment in British Columbia led to a head tax on immigrants from China, but the friendly diplomatic relations between Britain and Japan forbade its colony from restricting newcomers from Japan in such a way. Instead, Japan agreed to restrict emigration in the 1908 Hayashi-Lemieux "Gentlemen's Agreement". 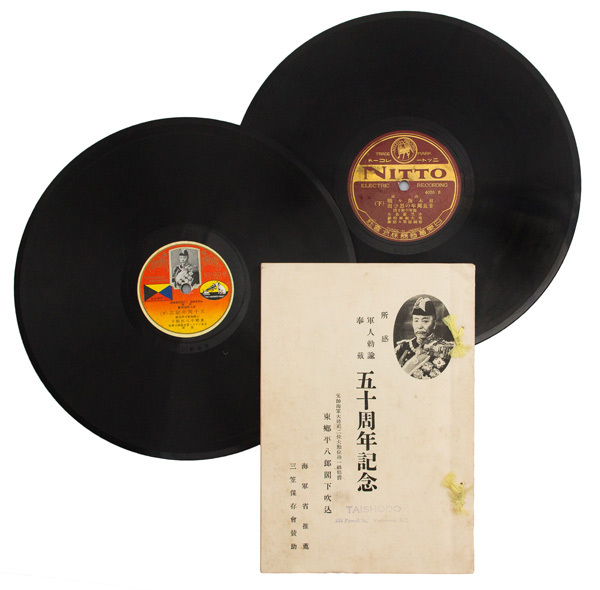 Japan was seen as a highly valuable ally, particularly after its impressive victory in the Russo-Japanese War. This victory drew admiration from all parts of the British Empire: in 1906, King Edward VII awarded the Order of Merit to Admiral Togo and Field Marshals Oyama and Yamagata, the leaders of the Japanese victory on sea and land. These three men were the first non-British subjects to receive the honour, which was “given to such persons as may have rendered exceptionally meritorious service in Our Crown Service or towards the advancement of the Arts, Learning, Literature and Science or such other exceptional service”. At the same time, the Emperor received the Order of the Garter as a sign of friendship between the two imperial powers. In Canada, news reports of Japanese military achievements were read with admiration: the town of Oyama in the Okanagan was named in honour of the Japanese field marshal, a name it is still known by today. 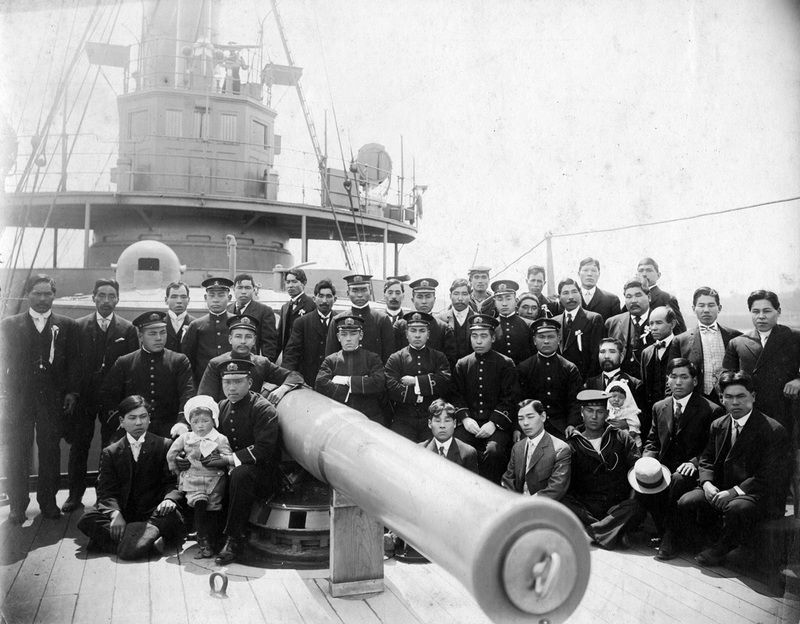 Admiral Togo made a brief visit to Vancouver in 1911, where he was welcomed as an honoured guest not only by the Japanese Canadian community and the Japanese Consulate, but also by the general public and the military. Visits of Japanese naval ships in 1909 and 1914 were also welcomed as signs of the Anglo-Japanese Alliance. They were seen as proof of friendly relations, mutual understanding, and respect between the two countries. Japan's military prowess was not, however, looked upon with a friendly eye by some BC politicians: in 1912, British Columbia's Premier McBride described what he imagined, in racist terms typical of the times, as "in the neighbourhood of 12,000 Japs, all ex-soldiers, all armed and ready if any trouble arises tomorrow" living in British Columbia who would threaten the province's coastline in the event of conflict with Asia. Japanese immigrants numbered only about 8500 at the time, including women and children, and many of the men later assembled to offer their abilities, not for an attack on the Canadian coastline, but to defend imperial interests in Europe. 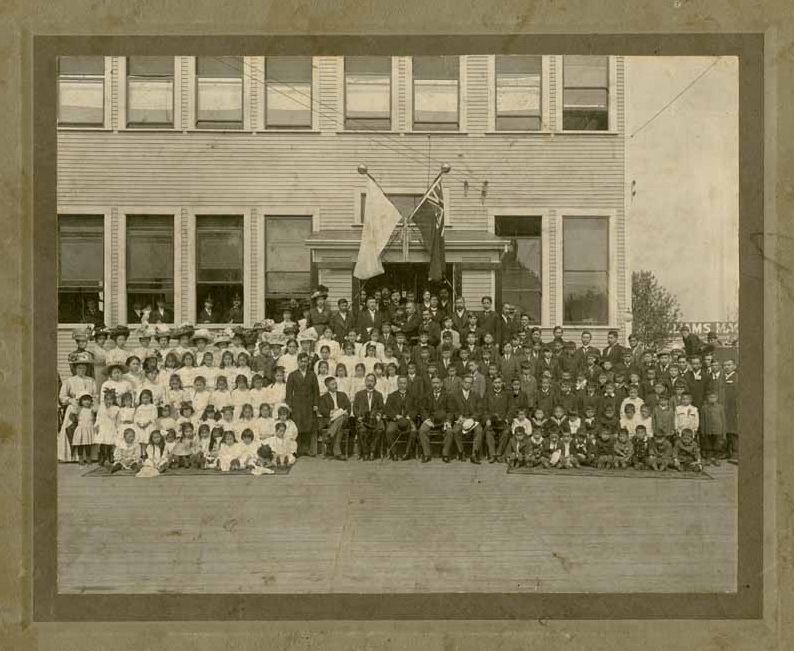 Group photograph with Admiral Togo in front of the Vancouver Japanese Language School during his visit to Vancouver, 1911. Loan courtesy of Ken Noma. Calligraphy scrolls by Admiral Togo. Loan courtesy of Ken Noma (left and right). 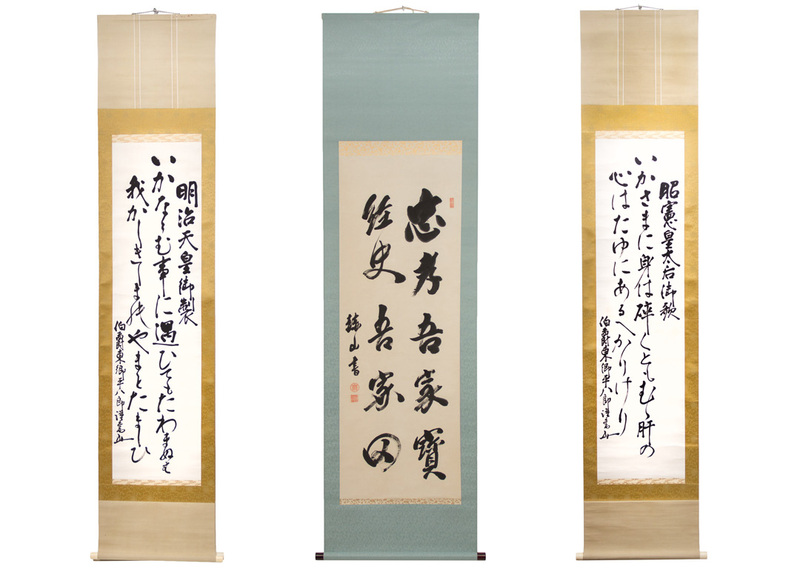 Scroll of calligraphy by Field Marshal Oyama. Loan courtesy of Ken Noma (centre). 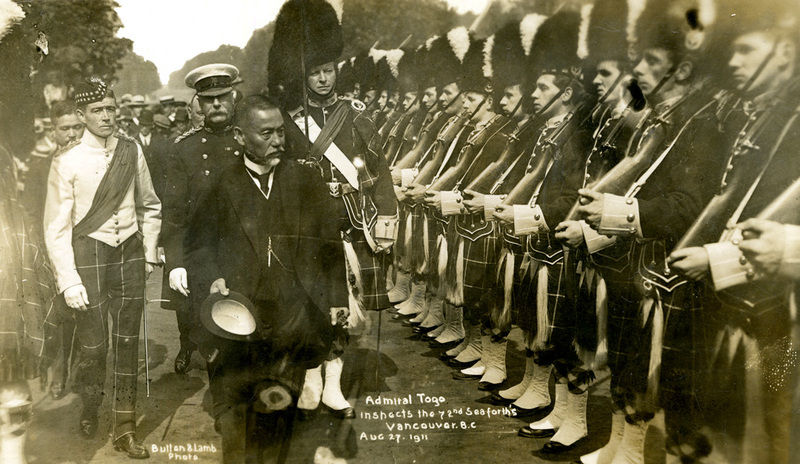 Admiral Togo inspects the 72nd Seaforth Highlanders of Canada in Vancouver, 1911. UBC Special Collections, BC-1296.